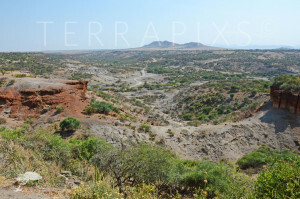 On a hot day in 1959, Louis and Mary Leakey were on an archaeolo dig in what had come to be known as Olduvai Gorge (from the Masai word “Oldupai” or sesal plant from which rope fibers were obtained) in Tanzania formed some 30,000 years ago by violent geological activity and subsequent erosion. They had been to Olduvai some years earlier but had to leave due to local unrest. That day in 1959 Louis Leakey had a high fever and rested while his wife, Mary, explored, uncovering numerous fossilized skull fragments and teeth of a hominid (members of human lineage) that no one had ever recorded before. In the following three weeks, the Leakey’s found more than 400 pieces comprising an almost complete skull. No doubt the 100 meter deep 30 mile long gorge echoed their shouts of joy at these and other astounding discoveries. Olduvai Gorge, part of the Great Rift Valley, is located in the eastern Serengeti Plains in the Arusha Region of Tanzania. Long thought to be the “Cradle of Mankind”, the Great Rift valley stretches through eastern Africa and over the years has yielded successive hominid fossils as well as many ever more complex stone tools upon which early man depended. Olduvai has yielded the remains of more than 60 hominids dating from 2.1 million years to 15,000 years, the longest known record. 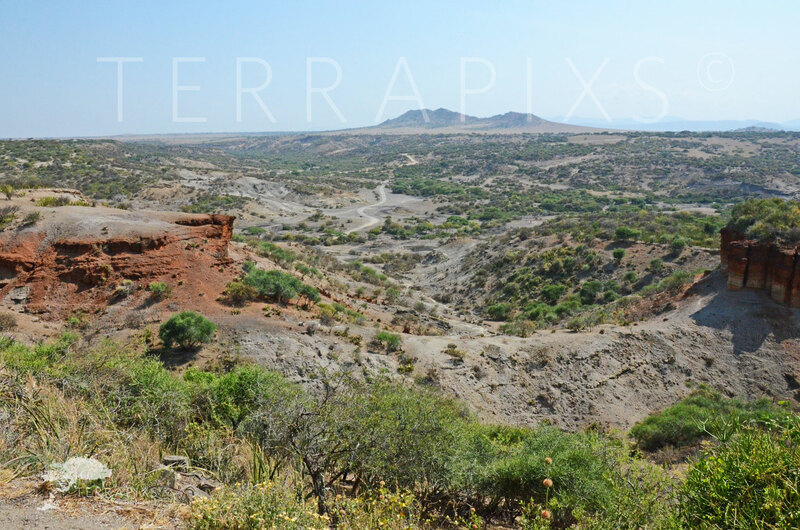 It’s June 15, 2015 and we visitors to the Olduvai were sitting on a roughly-hewn wooden bench perched on the edge of the Gorge. Before us was what you see in the above picture, an awe inspiring sight that stretched as far as the eye could see. The Olduvai museum was a few steps to our right, an older, rather small, unimposing structure that housed an array of fascinating artifacts. A little to our left a Masai Warrior (who by the way had a BS degree in Zoology) was lecturing on the Olduvai taking us back a million years, barely wink in time. Suddenly, his cell phone rang yanking us all back to the present. It was a strange sensation hearing that cell phone; and I couldn’t help but wonder where mankind would be in another 1000 years, or 10,000 years, if we survive, that is! Can technology save us from ourselves?